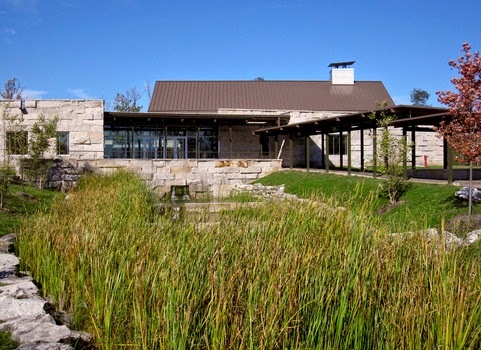 I spend Tuesday/Thursday on campus, and MWF out at my office at the peaceful, pristine Prindle Institute for Ethics situated in the DePauw Nature Park on the site of a reclaimed quarry. The strangest thing about my happiness here is that I don't have as many of my four "pillars of happiness" as I do at home. Writing, reading, walking, and being with friends are my four most reliable sources of everyday joy. Here I walk vastly less than I do at home, without my little dog Tank and best friend Rowan as faithful walking partners, and without Colorado's winter warmth and sun. 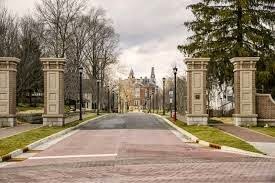 I've been writing less, as I'm so busy, filling every day with DePauw-related activities and conversations, and reading less for the same reason. I do have lots of delightful catching up to do with DePauw friends, but I have even more dear friends back home in Boulder. So why do I feel so fully alive here? Maybe it's the strong sense of community, similar to what I find with my church. On this campus, even as we're struggling with some painful issues of racial discrimination and exclusion, we work so hard together as a community to try to make things better. So maybe a strong sense of community is more important to me than I realized. I also love living in a small town - perhaps for the same reason? Or just because I like a certain scale to my life. I like having hardly any stuff, walking everywhere, residing in a town where the public library is steps away from the post office, which is steps away from the campus, which is steps away from the courthouse square. I've always loved small spaces. And yet my life here doesn't feel small. It feels big, stuffed full of intellectual challenge through constant talks and reading groups, concerts and conversations. I feel so fully alive, what Rousseau calls the "sentiment of existence." Or maybe I just like being constantly busy. I've always been the kind of person who likes having a long to-do list and then crossing things off, one by one.That, too, makes me feel like I'm living more intensely. I just found out yesterday that I lost a new friend to a tragic car accident. She was someone who lived with extravagant generous fullness, as writer, mother, friend. So whatever we can find to make ourselves feel the wonder of our existence most keenly, that's what we need to do. Today and always. Solitary road trips have their own magic, especially road trips off to a whole new life - well, in my case, a temporary return to a previous beloved life. I packed the car on Monday, taking remarkably little for my five months away: a carton of books for my Rousseau class, a carton of books for my Children's Literature class, a carton of books and papers for my own scholarly and creative projects. I laid my clothes on the backseat of the car. I tucked my stuff rabbit, Ruby, into the seatbelt on the front passenger seat. My book-on-CD, the delightfully smart and funny Where'd You Go, Bernadette?, was ready to pop into the CD player. The state maps I had gotten from AAA the last time I made this same drive were handy for consultation. Tuesday morning I slipped away at 5, in the pre-dawn darkness. I couldn't bear the thought of little dog Tank leaping up at me hoping for a walk, or my darling Kataleya holding up her arms to Mimsie for a cuddle. Better to make my getaway without the wrenching pain of a face-to-face goodbye. I scraped a little ice off my car and was on my way, listening, as I did last time, to the CD Gregory made for me years ago of all my favorite songs, everything from Natalie McMaster's fiddle music to Edith Piaf to Dolly Parton ("Here You Come Again") and Gladys Knight ("Midnight Train to Georgia"). It's wonderful to put the pedal to the medal to Bruce Springsteen's "Born to Run" and Jo Dee Messina's "Heads Carolina, Tails California." After an hour it was time to turn off I-70 to my chosen alternative, Route 36, which is just two lanes all across the Eastern Plains of Colorado and the northern edge of Kansas, as well as in eastern Illinois and western Indiana. Here you see the real America. Alas, for three harrowing hours, the real America I drove through was ice-and-slush-covered, totally deserted, with no gas stations or any sign of human habitation for a hundred miles (the one town is named "Last Chance"). Although the posted speed limit (insofar as you could read the signs, covered as they were from overnight blowing snow) was 65, I was lucky to do 40, holding so tightly to the steering wheel with both hands to keep from losing control of the car that my bad left shoulder ached. But it did get light finally, and I reached Idalia, Colorado (population, per 2010 census, of 88), and there was a cafe! Where I ordered two eggs over easy, hashbrowns, and homemade cinnamon-raisin bread toast! And when I left, the roads were somehow bare and dry, as if the terrifying last three hours had never happened. The rest of the drive was easy. I had my book to listen to, so the miles flew by. I stopped for lunch in Belleville, Kansas, at another little cafe. I had dinner with my friend Mike Cadden, a super-smart children's literature scholar, and his wonderful wife, LuAnn, a children's librarian, and sweet daughters, Rose and Lily, in their house on Lovers Lane (named after the Eugene Field poem), a house that radiates the love of this loving family. The next day I had a shorter drive, more like eight hours instead of the previous day's eleven (which should have been ten, if it hadn't been for those early a.m. road conditions). I finished Where'd You Go, Bernadette? with satisfied tears in my eyes. Then I listened to my Indiana music, a haunting CD of original piano compositions by my friend April Armstrong (she's not from Indiana, but her CD The Pink Rose was the soundtrack of my last two years here). I saved until I crossed the Indiana state line the song that of all songs is most Indiana to me, "Wish I May" by Carrie Newcomer. 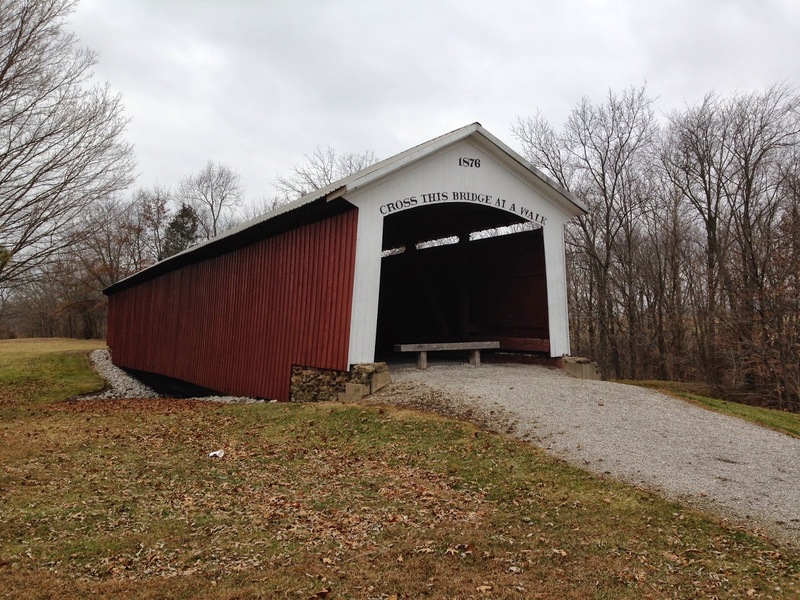 And as soon as I reached Indiana, there it was, a covered bridge! So much of what I love is in Colorado: most of my family, friends of 23 years, my church, two writing groups, a thriving writing community, stunning mountains, sunshine every day. So why do I feel that when I get to Indiana, I've reached home? For most of my writing career, like most writers, I wrote alone. I rose early in the morning, made myself my mug of Swiss Miss hot chocolate, and scribbled away on the couch, longhand, for my trademark hour a day. Ten years ago, Snickers the cat joined me as a writing companion, but she is actually more of a purring companion, as her writing productivity seems close to nil. But a year or so ago, Jeannie Mobley, author of fabulous historical fiction for young readers (Katarina's Wish, Searching for Silverheels) , invited me to a write-in at her house: a group of writers hanging out for the day and the night (we even had the opportunity to sleep over, which I seized), to write together. I got there early in the morning and started writing. I wrote for hours. We broke for a leisurely lunch of wonderful writerly conversation. And then I wrote for more hours. I wrote more in a day than I had ever written before. It was energizing and exhilarating. I was hooked on writing with others. Now I have one friend with whom I make writing dates of the kind Natalie Goldberg talks about in Writing Down the Bones; Cat and I have written together up at Chautauqua, in the lobby of the historic Boulderado Hotel, and at her cozy house while her little boy was napping. I've been back to Jeannie's for at least one more write-in there. And yesterday I spent a delicious, deliriously happy day with a group of writers, including Jeannie, at the home of writer Jean Reidy, perhaps best known for her delightful picture books, Too Purpley, Too Princessy, Too Pickley. Here's what I accomplished yesterday. In the car on the (long) way there, I brainstormed the pet aspects of my current work-in-progress, the fifth Franklin School Friends book, which involves a pet show; my passenger in our carpool was a pet expert who has raised a menagerie of animals - could anything be more perfect than that? At Jean's, I made extensive notes for the whole book, finally figuring out Cody's character arc and various complications of the plot. I wrote all of Chapter One. I wrote much of Chapter Two. Go, me! Why am I able to be so much more productive at these write-ins than I am at home? Why do I, who can usually write only an hour a day (and who prefers to pace myself that way), write on without ceasing? The only reason can be that I'm surrounded by other writers who are pushing themselves beyond their usual limits, too. Creativity is in the air. There is also something about consciously dedicating an entire day in this way, deliberately marking it out as special. Stimulating as a write-in is, I don't think I could do it every day. One a week maybe, but not more. But oh, the bliss of writing so much, so quickly, with such zest. Plus making new writer friends. Plus eating all the desserts writers always bring to share. Yesterday, at the home of the creator of Too Purpley, nothing was "too" anything. It was all completely, wonderfully right. I gave a talk on Saturday afternoon, on new year's resolutions for writers, for the Society of Children's Book Writers (SCBWI). To my great surprise, 40 people crammed into the meeting room of the Arvada Public Library to hear me speak. Apparently, I'm not the only writer who is wild to make new year's dreams, goals, plans, objectives, lists. 1. According to one survey, only 8 percent of people keep them. A full quarter give them up after ONE WEEK. 2. Resolutions can not only fail but even backfire. Writer Anne Lamott says that her therapist asked her, when she announced a new year's diet some years ago, "That's great, honey. How many pounds are you trying to gain?" 3. Resolutions seem to come from a place of self-dissatisfaction. THIS year I won't screw up (the way I did last year). THIS year I'll take of the weight (that I put on last year). THIS year I'll write the book (that I got stalled on last year). So the task I set for us in the workshop was to try to figure out how to achieve the good of resolutions (since I was speaking to a room full of people wild to make them, including myself) while avoiding these pitfalls. I began with sharing my own system of documenting what I call "Nice Things and Accomplishments" month by month throughout the year. This system of recordkeeping ensures that we avoid at least the third pitfall on the list: reinforcing a sense of shame and failure. I have a little notebook where I list each month's biggest achievements and greatest joys. I'm picky about what I list: writing a chapter counts, writing a page doesn't (unless it's maybe the VERY first page of a project I've been dreading for ages). Having lunch with a friend doesn't count, unless it's a friend from out of town visiting, or unless conversation at lunch was particularly life-changing. Reading a book doesn't count (I keep a separate list of all the books I read in a year), unless the book was especially wonderful. Three that made the cut here were War and Peace (well, natch! ), Emily of Deep Valley (the one Betsy-Tacy book I hadn't read because it was out of print for so many years), and a 1910 novel called Queed that is mentioned in Carney's House Party (one of the Betsy-Tacy books). I usually end up with seven or eight items for each month. Looking back at my list for 2014, I see that I had a low of five for June and December (but some of these were huge - e.g., in December I revised a novel, extensively, and sent it off to my publisher AND I celebrated Kataleya's first Christmas where she starred as Baby Jesus in the Living Nativity on Christmas Eve). I had a high of fourteen for March (some of these were passive things, on my part, like finding out, through diligent self-Googling, that Kelsey Green, Reading Queen was a Washington D.C. Capitol Choice book and Zero Tolerance was on the Cooperative Children's Book Center's best-books-of-the-year roundup. So far this year, January has three things: 1) the sermon I gave on the three wise men for Epiphany Sunday (which might have been my best sermon ever), 2) a labor-intensive (but very fun) review I did for Routledge of a scholarly children's literature collection that they are considering for publication, and 3) the very talk for SCBWI that I'm blogging about here. I already know that more are coming. I'm going to write my abstract for the talk I want to give at the Children's Literature Association conference in June, and I'll submit it by the deadline of Jan. 15. (Note that I will give myself credit for writing and submitting the abstract, and get credit again when/if it's accepted, and credit again when/if I deliver it). I'm going to start writing the fifth book in the Franklin School Friends series. 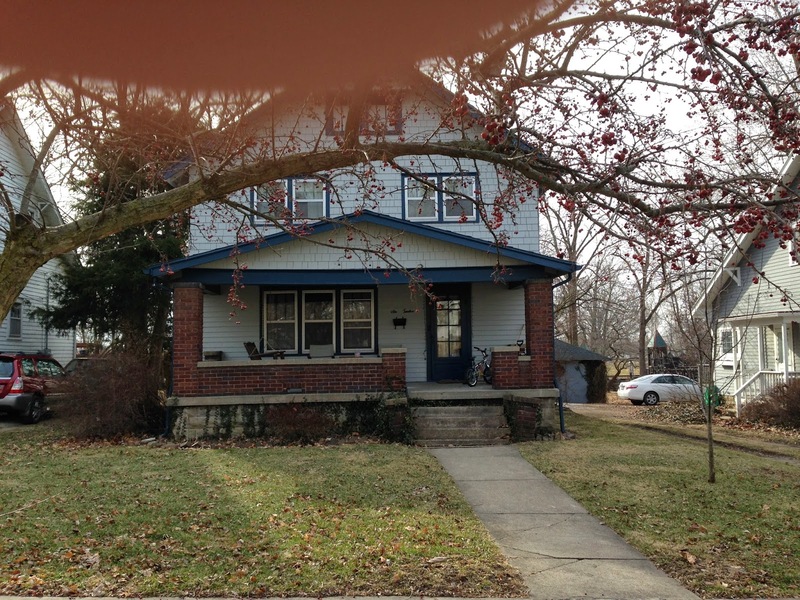 I'm going to move to Indiana and launch my new semester of teaching there. So I'm guaranteed to get at least six, and maybe more if I do more self-Googling and unearth another little nice tidbit or two. I have a tendency to wail about my life: oh, I'm accomplishing so little! Look at all the time I'm still wasting on Sudoku! Look at those mornings I can barely get myself get out of bed! But then, I look back at the list in my little notebook, and I see so many accomplishments documented, month after month after month. So my resolution for you this year: start keeping your own "nice things and accomplishments" list. And my resolution for myself: keep adding to mine, item by item, month by month, all achieved in an hour a day. I already know that any success I've ever achieved in my life has come about through early rising, and what I don't get done during the first, best hour of the day remains undone at nightfall. I lie in bed every morning, as I see the digital clock by the side of the bed register 5:00 and Snickers begins to meow on cue for breakfast, and I know I have to get up, I have to, I simply have to! I reenact the scene from Bambi, where Bambi lies wounded in the forest as a raging fire approaches, and his father, bowed beneath the weight of his massive antlers, commands him, "Bambi, get up! You MUST get up!" I lie there in bed and try to echo that patriarchal authority: "Claudia, get up, you MUST get up!" I sing to myself the hymn that begins, "Once to every man and nation comes the moment to decide." I change the words to read, "Once to every children's book author comes the moment to decide." I know that this is MY moment to decide: am I going to get out of bed and write, or give up my author dreams and slumber on? I know what the answer has to be. But sometimes I sleep instead. So in these grave circumstances of sloth and inertia, I have now resorted to the following exhortation: "Okay, Claudia, you don't have to write your book early this morning. You don't have to work on your syllabi for your two classes (which begin January 26 in Indiana). You don't have to review that edited collection for Routledge. You don't have write your paper for the Children's Literature Association conference (due January 15)." I tell myself, "You just have to do SOMETHING. You just need to do ANYTHING AT ALL." But hey, now my tax files are in apple pie order (something I needed to do before I leave for Indiana on January 20, as why would I want to drag all that stuff there and back? ), and I'm enthralled by Susan's book and can't wait to discuss it with my colleagues and students. Plus, I'm so energized and happy from these two accomplishments that I'm going to do more work this afternoon, just for the heck of it. So my hot time management tip for today: while it's best to start your day doing the work that is most urgent and important to give meaning to your life, sometimes it's okay just to do anything at all.